A 26-year-old previously healthy woman developed sudden-onset hypoxaemic respiratory failure 3 days post partum. During pregnancy, the patient had displayed haematuria (26–50 red blood cells/high-power field on urine dipstick) and proteinuria (30 mg/dL on urine dipstick), which at the time was not further investigated. The pregnancy and vaginal delivery were otherwise uncomplicated. On the morning of planned discharge from the maternity ward, the patient developed sudden dyspnoea, tachypnoea, tachycardia and severe hypoxaemia (PaO2 of 48 mm Hg on room air) accompanied by 5 mL of bright red haemoptysis. Chest auscultation was normal. ECG showed sinus tachycardia with an S1Q3T3 pattern and urgent bedside echocardiogram showed evidence of right heart strain. Respiratory insufficiency in the peripartum period has many potential causes, including PE, amniotic fluid embolism, pulmonary oedema due to tocolytic therapy and peripartum cardiomyopathy. Venous thromboembolism (VTE) is approximately 80 times more common in the first week post partum when compared with the general population1 and PE is a leading cause of maternal mortality in the developed world (whereas postpartum haemorrhage is the most common cause of death in the developing world2). Haemoptysis in the setting of PE occurs in about 5% of patients, and represents pulmonary infarction.3 Given the acute onset of symptoms and echocardiographic findings, PE is the initial concern for this patient. Unfractionated heparin infusion was started. Shortly thereafter, the patient endorsed worsening dyspnoea and coughed up approximately 100 mL of bright red blood. Her heparin infusion was discontinued, and she was emergently intubated for hypoxaemia. Adequate oxygenation on the mechanical ventilator was difficult to maintain despite frequent endotracheal suctioning, use of high positive end-expiratory pressure and fraction of inspired oxygen (FiO2), initiation of neuromuscular blockade and frequent manual recruitment manoeuvres. Chest X-ray (CXR) showed diffuse, predominantly central opacities (figure 1), and a complete blood count demonstrated a decrease in serum haemoglobin from 12.8 g/dL (prepartum) to 7.1 g/dL. 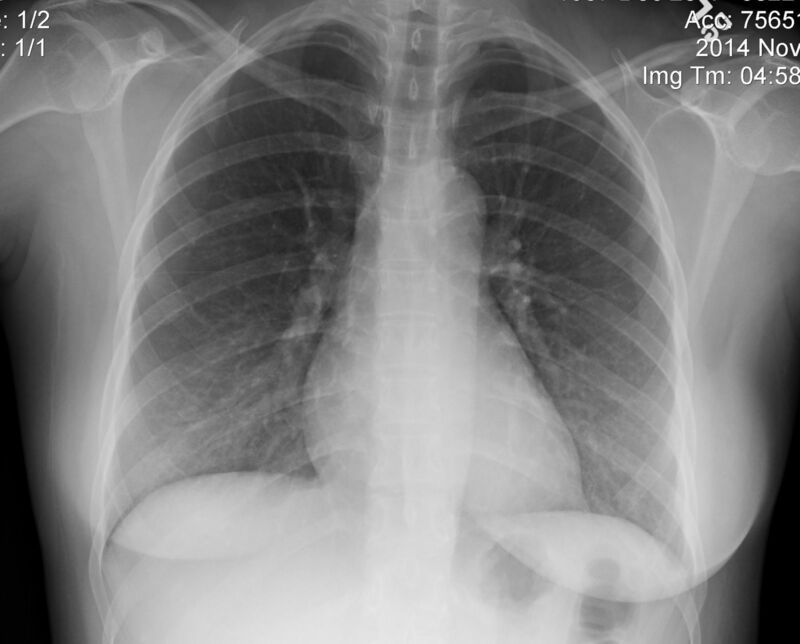 Chest X-ray (CXR) on day of decompensation demonstrating diffuse, bilateral opacities. Emergent bedside flexible bronchoscopy showed diffusely haemorrhagic airways, but did not identify a focal bleeding source. When the bronchoscope was reinserted after suctioning, fresh blood was again seen in all airways, consistent with DAH. A bronchoalveolar lavage was not performed due to the patient's marginal oxygenation. The patient was transferred to the intensive care unit (ICU), where inhaled nitric oxide and inverse ratio pressure-controlled ventilation were initiated as rescue therapies. Owing to concern for immune-mediated DAH, pulse dose methylprednisolone (1000 mg/day) and plasmapheresis were urgently started. On further examination, the patient had no palpable purpura or other skin rashes associated with vasculitis and no synovitis. Laboratory results were negative for antinuclear antibodies, rheumatoid factor and antiglomerular basement membrane antibodies. Antineutrophil cytoplasmic antibody (ANCA) immunofluorescence, however, was positive at a dilution of 1:320, and ELISA for antimyeloperoxidase antibody was positive at 186 antibody units/mL. 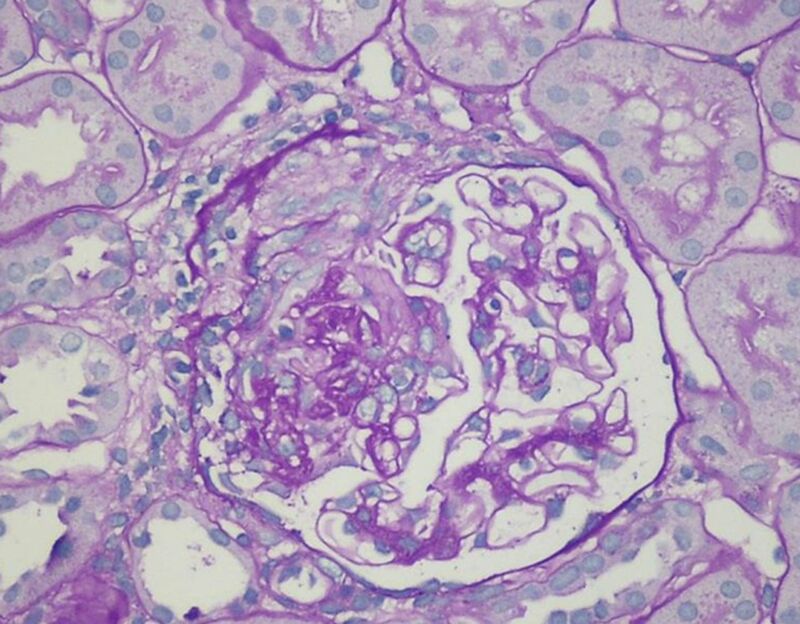 Given her previously noted proteinuria and haematuria, a renal biopsy was performed, showing a pauci-immune crescentic glomerulonephritis (figure 2). The patient was diagnosed with microscopic polyangiitis (MPA). Renal biopsy light microscopy showing crescent formation. While the kidney is the most common organ involved in MPA, the lung is another frequent target organ. Pulmonary capillaritis leading to DAH is more commonly seen in MPA than in granulomatosis with polyangiitis (formally Wegener's granulomatosis),12 ,13 another ANCA-associated vasculitis. Case series suggest that anywhere from 12%14 to 48%15 of patients with MPA develop DAH during their disease course; this can also predate other extrathoracic manifestations by up to a year.14 Haemoptysis, as seen in our patient, is common in patients with MPA who develop DAH.15 ,16 For ANCA-associated vasculitis, retrospective data suggest that plasmapheresis improves outcomes in the setting of alveolar haemorrhage.12 The exact role of plasmapheresis in disease induction therapy is the subject of an ongoing trial (http://www.clinicaltrials.gov; PEXIVAS; NCT00987389). The patient was continued on high-dose prednisone (1 mg/kg) and completed a total of six plasma exchanges. Her gas exchange improved significantly within 48 h of corticosteroid therapy and plasmapheresis, and she was successfully extubated after 6 days of mechanical ventilation. Pharmacological prophylaxis for VTE was not used during her hospitalisation because of her alveolar haemorrhage, though appropriate mechanical VTE prophylaxis was provided. Once extubated, induction therapy with rituximab was administered (375 mg/m2×4 weekly doses). Rituximab was chosen because of its favourable side-effect profile, specifically to avoid the risk of cyclophosphamide-induced premature ovarian failure. The excretion of rituximab in breast milk is unknown and thus the patient elected to avoid breast feeding. The patient was discharged in stable condition. Three weeks later, however, the patient developed acute shortness of breath and orthopnoea. CXR showed marked improvement in her pulmonary infiltrates (figure 3) and transthoracic echocardiogram showed normal biventricular function without a pericardial effusion. CT angiography of the chest revealed filling defects in the lower lobe pulmonary arterial tree, consistent with acute PE. Therapeutic systemic anticoagulation with unfractionated heparin was begun. 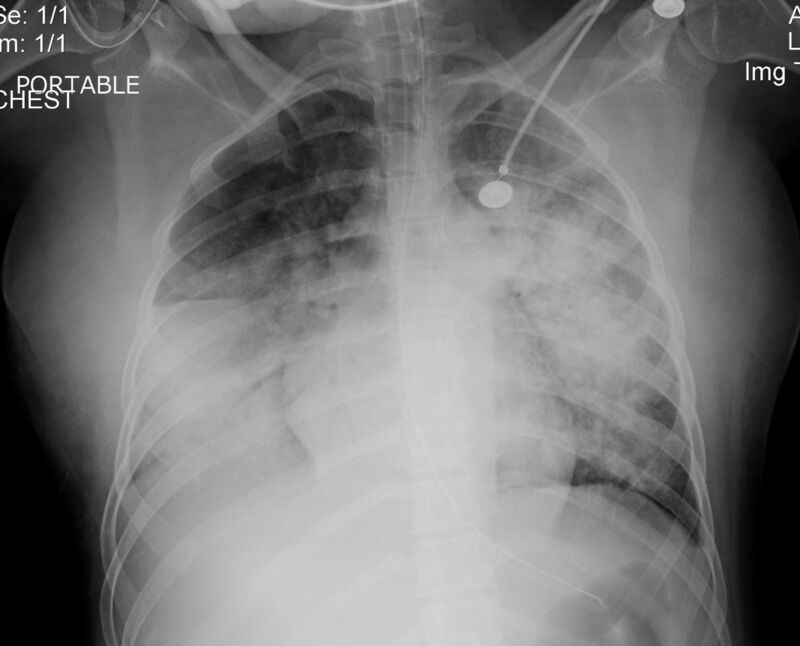 Chest X-ray (CXR) 3 weeks after therapy showing resolution of infiltrates. ANCA-associated vasculitis is associated with a markedly increased risk of VTE, especially when the disease is active;22 the patient's recent ICU stay with neuromuscular blockade and her postpartum state are also risk factors. Given that her current CXR shows resolution of her previous DAH, the benefits of anticoagulation outweigh the risks in this setting. The patient's shortness of breath improved with anticoagulation and she was discharged on warfarin. On follow-up evaluation 3 months later, the patient was doing well with no cardiopulmonary symptoms. Given the high rate of relapse of ANCA-associated vasculitis, maintenance therapy with rituximab is planned. The optimal duration of anticoagulation for VTE that occurs during pregnancy or immediately thereafter is unknown. Generally, the total duration of therapy should be 3–6 months from time of diagnosis for patients with transient risk factors, extending to at least 6 weeks post partum, given the significantly increased risk in the immediate postpartum period.23 ,24 For patients who have a persistent risk factor, longer duration of therapy is warranted.25 We elected to treat our patient for 6 months with anticoagulation, with close monitoring for further venous thromboembolic events. Persistent haematuria and proteinuria during pregnancy should not be dismissed as this may be a sign of a potentially serious underlying disease. One should never be wedded to a diagnosis; although it was reasonable to treat empirically for PE in a postpartum patient with acute-onset respiratory failure and haemoptysis, alternate diagnoses, even rare ones such as vasculitis with DAH, should be considered as additional clinical information becomes available or if the patient does not respond to appropriate therapy. The different provider teams should approach each patient encounter with a degree of objectivity; failure to do so when the patient returned to the emergency department after her initial hospitalisation for DAH could have missed the subsequent diagnosis of PE.
. Microscopic polyangiitis: a large single-center series. J Clin Rheumatol 2014;20:179–82. DRB and KTM contributed equally. Contributors All contributing authors were involved in the care of the patient. DRB drafted the initial manuscript. KTM summarised the clinical information. All authors participated in literature research and extension of the initial draft. All authors agreed on the final submitted version. DRB and KTM contributed equally to the work and are responsible for the overall content of the manuscript as guarantor.